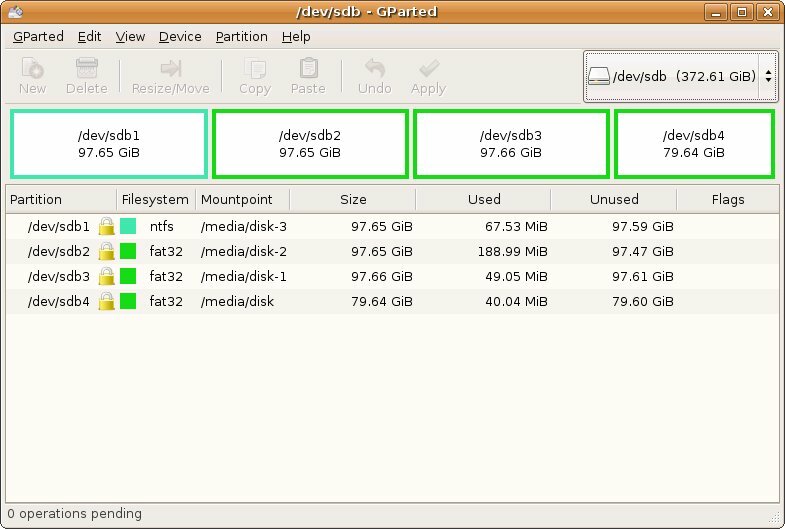 GParted is the GNOME Partition Editor application. It is used for creating, destroying, resizing, moving, checking and copying partitions, and the file systems on them. This is useful for creating space for new operating systems, reorganizing disk usage, copying data residing on hard disks and mirroring one partition with another (disk imaging). It uses libparted to detect and manipulate devices and partition tables while several (optional) file system tools provide support for file systems not included in libparted. These optional packages will be detected at runtime and do not require a rebuild of GParted. GParted is written in C++ and uses gtkmm as Graphical Toolkit. The general approach is to keep the GUI as simple as possible and in conformity with the Human interface guidelines. There are also Live CD and Live USB versions available, based on Gentoo Catalyst and built on the latest 2.6 Linux kernel. They are updated with each new GParted release. The Live USB version is identical to the Live CD except for some altered boot scripts. GParted is also available on other GNU/Linux live CDs, including recent versions of Knoppix. This utility should not be confused with GNU Parted, the command line frontend utility published by the Free Software Foundation.